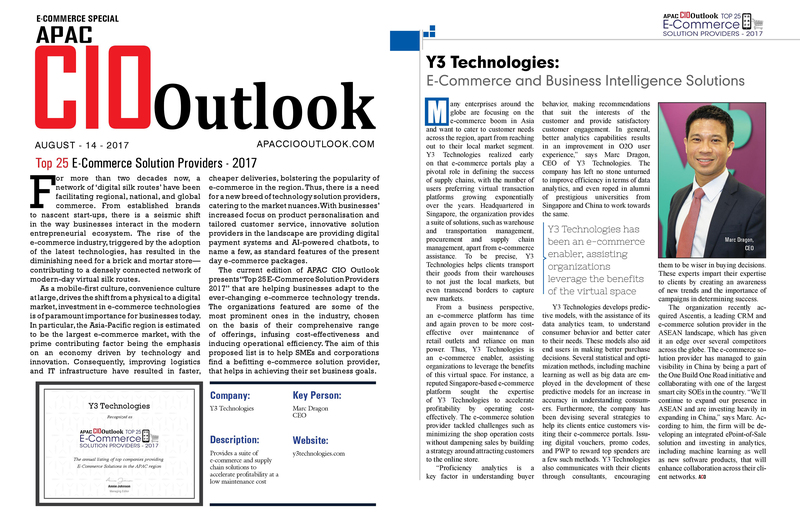 Y3 Technologies has been featured in the August edition of APAC CIO Outlook as a Top 25 eCommerce Solution Provider. Awarded by APAC CIO Outlook, a leading regional publication featuring the latest trends and insights in business, innovation and technology, the award recognizes leading enterprises that are helping businesses adapt to the ever-changing demands of customers with the advent of rapid eCommerce growth and the emergence of omnichannel commerce across the region. Recipients are evaluated based on their comprehensive range of offerings, combining cost-effectiveness with significant improvements in operational efficiency for clients. The feature discusses how Y3 leverages its deep in-house capabilities in embedded analytics, deploying various statistical and optimization methods, proprietary algorithms and machine learning to unlock unparalleled insights into customer buying behavior to ultimately driving winning omnichannel customer experiences and remarkable conversion rates for its industry-leading clients.